Abel Ntambala was thinking about leaving his family’s dairy farm in central Uganda and looking for work in the capital, Kampala, about a three-hour drive away. 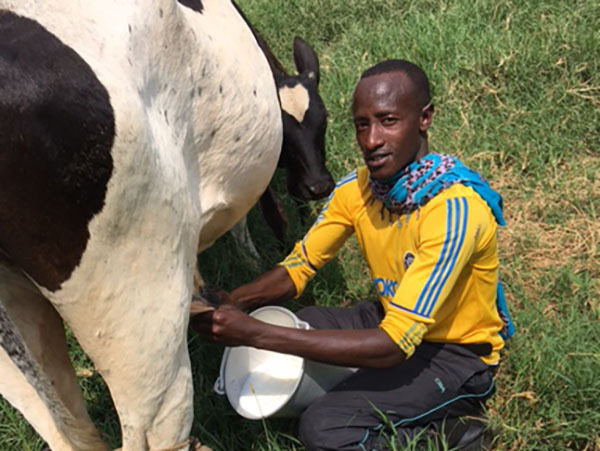 “I just didn’t see many opportunities to earn more money and improve my life,” said the 22-year-old man, sweating in the mid-afternoon heat as he stood among the 15 cows his family owns in the district of Kiboga. But he decided to stay on the farm after the local economy began to boom. Driving the growth was a dairy and livestock farmers’ cooperative, which was created in 2011 and now has nearly 600 members. The hub is part of the East Africa Dairy Development project, led by Heifer International and launched in 2008. The project has received $51.3 million in funding from the Bill & Melinda Gates Foundation and has benefited more than 315,000 farmers in Kenya, Rwanda, Tanzania and Uganda. Before the cooperative, farmers sold their milk to traders, who bargained with them individually and usually offered about 100 shillings (30 cents) per liter. The price was often a take-it-or-leave-it proposition. Now, the farmers deliver their milk to the cooperative’s dairy hub, which bulks the milk and stores it in a chiller until it’s collected by a tanker truck from a local processor. Milk quality and productivity have greatly improved because the farmers have been learning better dairy practices through the cooperative. And by leveraging the negotiating power of the big group, the farmers are now getting more than 10 times more per liter than they earned before. Expansion plans include buying milk-processing equipment and a tanker truck. The spillover-over effects in the local economy are obvious. Most of the milk is transported to the dairy hubs by motorcycles, creating jobs for dozens of youth. Roadside shops are popping up around the hub, selling cold drinks and snacks to the dairy hub workers and delivery drivers. A small shack offers engine repairs for the motorcycles. Natambla was quick to get into the action. He rents a motorcycle that he uses to deliver the milk from his family’s cows and seven other farms. This helps him earn a tidy side income of 30,000 shillings (US$10) a day, which enabled him to save up enough to buy two of his own cows. Although he enjoys farming and wants to continue, he’s also an entrepreneur and wants to explore more ways to diversify his income. He’s excited about the East Africa Youth Inclusion Program. It’s a US$19 million project launched by Heifer International and Mastercard Foundation in August 2017. The program aims to help young people find jobs or start businesses in the dairy and agriculture industries in Uganda and Tanzania. Youths who live around the bustling dairy hubs are prime potential participants for the program. Natambla taking some training courses that will help him acquire mechanical skills.